CHICAGO – Jay & Mark Duplass clearly know a thing or two about sibling rivalry. They capture that unique blend of affection and competition in their clever and sweet “The Do-Deca-Pentathlon,” a comedy that didn’t get nearly the attention of recent efforts like “Cyrus” and “Jeff, Who Lives at Home” because of a lack of star power but makes a satisfying rental now that it’s on Blu-ray. Anyone with a brother or sister knows that it’s a very unique dynamic that we share with our siblings. We often want to beat them in competition as much as we root them on. It’s a natural sense of battle that the Duplass brothers’ turn into comedy in their brief (76 minutes) comedy about two brothers who staged the title event when they were teenagers to decide who was the best brother for all eternity. After a controversial ending, they’ve gone on to their lives and had to deal with adult issues but never lost their sense of rivalry. It’s sparked again at key moments in each of their lives and while the resulting comedy may be a little slight, it is so in charming, fun ways. Note: The film is a 3.5/5.0 affair but the near-lack of special features on the Blu-ray drop the Blu-ray grade half-a-star. Two grown men take sibling rivalry to new heights of hilarity in this winning comedy with heart. All bets are off during a family reunion when estranged brothers Mark (Steve Zissis) and Jeremy (Mark Kelly) secretly resurrect a decades-old quest to be the best. Determined to complete 25 outrageous events in order to crown a true champion, the exhausted pair find themselves leg wrestling, ping-ponging, and laser tagging to the finish line…while learning a few life lessons along the way. Written and directed by the comically competitive Duplass Brothers (Cyrus), The Do-Deca-Pentathlon brings home the gold - and the laughs! 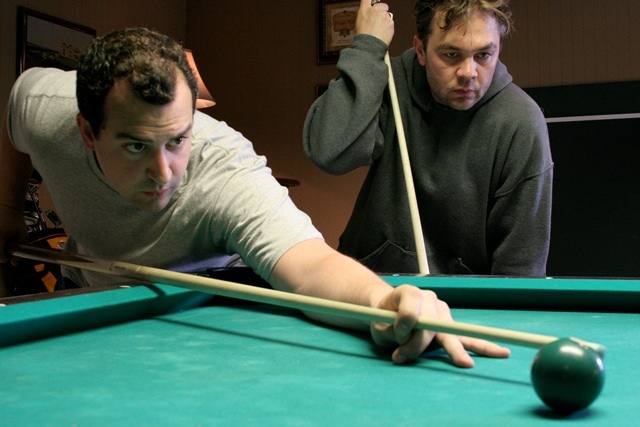 “The Do-Deca-Pentathlon” stars Steve Zissis and Mark Kelly. It was directed by Jay & Mark Duplass. It was released on Blu-ray and DVD on September 18, 2012.